Homemade pasta is tastier, healthier and more filling than what you can buy. I guess I’m spoiled when it comes to homemade pasta over a boxed package. You can’t beat the taste, texture, how filling it is, and knowing your ingredients are preservative free! Besides, you’ll discover how delicious and easy making your own dough is from scratch because if you want to save lots of money on your grocery bill invest in a pasta machine. I like the old-fashioned manual pasta machine as you can see from my picture. Some friends of mine have the electric pasta machines and hate it because it is too slow. Once you get the hang of my simple recipe, you can make your pasta dough in the food processor and crank out the dough in your pasta machine in about thirty minutes! Involve the kids with flouring your dough, cranking, or just moving aside some of the finished noodles can be a wonderful and fun learning experience. At our house, sometimes my hubby and the kids make the dough and time themselves to see if Dad’s team is faster to get dinner on the table on pasta day or Mom’s team. This may sound silly, but cooking together as a family is a lot of fun. It also makes children feel they accomplished something special with another new skill. The less work involved, the better I like it. For this reason, I always make my dough in my food processor. This really is a great tool in addition to your pasta machine. Manual pasta machines are fairly cheap. I think I paid about $50. I did wear out a few screw parts that attach to the table. But found replacements, which were untouched in a box with a brand new pasta machine, at the flea market for $5.00! Some people get them as gifts and never even open the box. Unfortunately, I bought my machine in the store and only needed the part. Still, the part was cheaper at $5.00 than going to the hardware store for a replacement, which I checked. My recipe uses plain flour–not more expensive semolina flour. Some people insist upon using just semolina, which I’m sure is excellent. However, I am showing you my cheap version that tastes wonderful to my family. Usually when I make pasta, I whip up enough dough for soup noodles as well as pasta for dinner. This saves me time and thoughts of what to prepare for lunch. If you don’t want to save any for soup noodles, then put some aside to reheat another time in your microwave after you prepare the finished pasta. You could invent another quick lunch or even dinner around your precooked pasta noodles. Either way you work it, you’ll love how special homemade pasta is. Trust me, you’ll be nuts about it once you taste the difference. Put everything in your food processor with the dough blade and process until it forms a ball. Remove and place on a lightly floured surface. Cut into pieces and flatten. If the dough sticks, you dab the piece in some flour. Then you fit that piece through your pasta machine using the thick setting (number 1). Do this for all the pieces you cut. 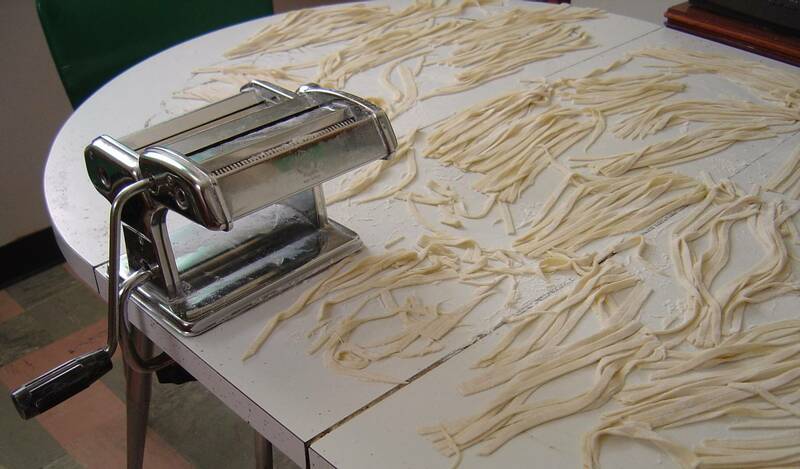 After you run the dough through the number 1 setting, you adjust your pasta machine to the thickness of your choice. My preference is (number 4), which reminds me of a linguini noodle. Keep flouring if you need to. Run all the flattened pieces through the thinner setting, then you’re ready to remove your crank and fasten on the noodle side. Crank all the pieces and set aside until you’re ready to start boiling up the pasta. All you need is a wonderful sauce, and presto dinner is ready! Previous Post Flea Market Finds: Need a Great Gadget?